"The comedy party for kids that were never invited to parties." Top (left to right): Wonderdave, Marc Abrigo, and Kristee Ono; botom: Stephen Ku and Tirumari Jothi. Stephen Ku is a Bay Area native, stand-up comedian, and founder of the nerd-comedy network Komedio. As an avid fan of comics, tabletop board games, and Star Wars, he says his nerdiness has been a major influence on his comedy. "My favorite place to perform is where I can do my nerdy material," said the Berkeley resident. He isn't alone in this, either. "There's so much nerdy comedy in the Bay," he said, but "not a lot of it is getting pushed." It was this observation that led to the concept of a network. "I thought we could get together, almost like a guild, and promote each other's shows. It's spiraled out from that." 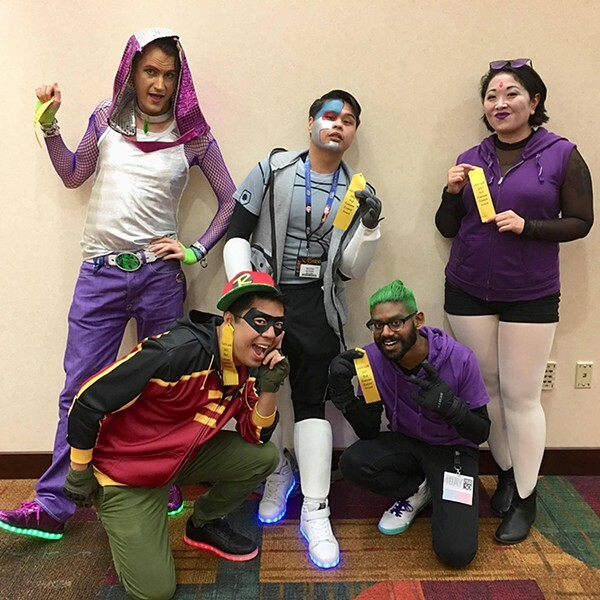 Ku found cohorts for this "guild" of nerds in September of last year at San Francisco Comic Con, where he performed alongside comedians Marc Abrigo, Kristee Ono, Tirumari Jothi, and Wonder Dave, all of whom now comprise the core membership of Komedio. As a network and brand, Komedio produces, promotes, or is affiliated with four recurring shows in the Bay Area: the nerd comedy showcase "Issues," produced and hosted by Jothi, on every second Friday at the Comix Experience Outpost comic book store in San Francisco; the drinking and gaming competition Super Trashed Bros., also hosted by Jothi, at the Brewcade in San Francisco every first Monday, with a larger team-based event happening at PianoFight! every fourth Saturday; Literary Pop, produced by Wonder Dave, which in his own words is "a show where writers, comedians, and storytellers come to perform about the pop culture they're obsessed with" and takes place at a variety of venues and literary events around the Bay; and The Geek Show, "a theatrical love letter that uses sketch comedy, scripted drama, improv, and film to celebrate and critique geek culture," produced in part by Abrigo and presented by Bindlestiff Studios, which had a successful theatrical run this April and is now gearing up for a follow-up production. This variety lends itself to Komedio's strength and versatility as a network. Ku explained the breadth of content is possible because "when we started we decided that each of us would focus on what we're good at and what interests us." Most of the live shows existed before Komedio was established and were simply brought into the fold by the associated members. In terms of original, in-house, created content, the network produces a weekly podcast called Nerd Rage: The Great Debates, which brings in new guests every week to argue over the superiority of various icons of nerd culture. The show is recorded and edited by Will Scovill, Komedio's sole technical producer, and hosted by Abrigo. The show's focus is less about the outcome of the debates as it is the outlandish, irreverent, and brash channels by which the guests argue their cases, which leads to hilarious clashes in opinions about everything from Nickelodeon vs. Cartoon Network to Freddy vs. Jason vs. Alien vs. Predator. The show is recorded and distributed from a studio in Berkeley. Komedio also bolsters a refreshing amount of diversity in its core membership as well as the guests it brings on for shows and the podcast. The members hit a wider spectrum of ethnicity, sexuality, gender, and the intersection of all three than one might expect from a "nerd"-based comedy coalition. The members assert this was solely by accident and Komedio has never marketed itself based off of its diversity. "We don't tell people they should book us because we're diverse," said Ku. "Book us because we're funny." Yet this diversity allows the network to present a wider array of what a nerd can look like without ever falling into the realm of tokenization. "It's very special to me that we are such a diverse group," said Ono, "and it's even better that it's a thing we don't have to address amongst ourselves. We treat it like it's normal when we go to shows and conventions." Komedio's strength lies in its ability to take comedy into a realm of financial and professional sustainability. "It's gratifying to feel like we're all on the same page," said Jothi, "not just in terms of hobbies and interests, but in a way where we want concrete and actionable things in regards to comedy." The network aims to increase visibility and attendance for shows it promotes, but also functions as a vehicle to bring the Bay Area's nerdiest productions to conventions across the country. Thus far, the network has brought stand-up, various showcases, and live productions of Nerd Rage to various conventions, including Gen Con, Comic Cons in San Francisco and Silicon Valley, as well as smaller local events. This is an impressive résumé given that the network has been around for less than a year, but according to Ono, who serves as Komedio's liaison with conventions, being a group that offers a lot of content specifically related to nerd culture "opens a lot of doors."